Yeah, I know, I’ve been making pies for a while that’s not normal. I really prepare a lot more things at home, but lately it’s what I want to make the most. For me it’s a very relaxing process and once I’m finished, the whole family enjoy it. I’m not going to lie to you! Today’s cake was a complete stranger to me, I’ve never seen it before, although I’m so glad I did. 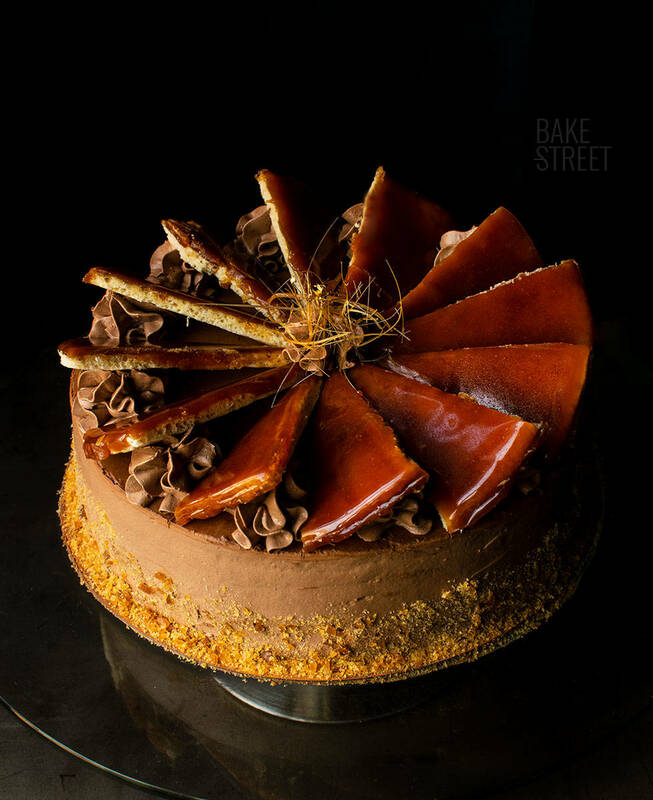 It’s the Dobos Torte. 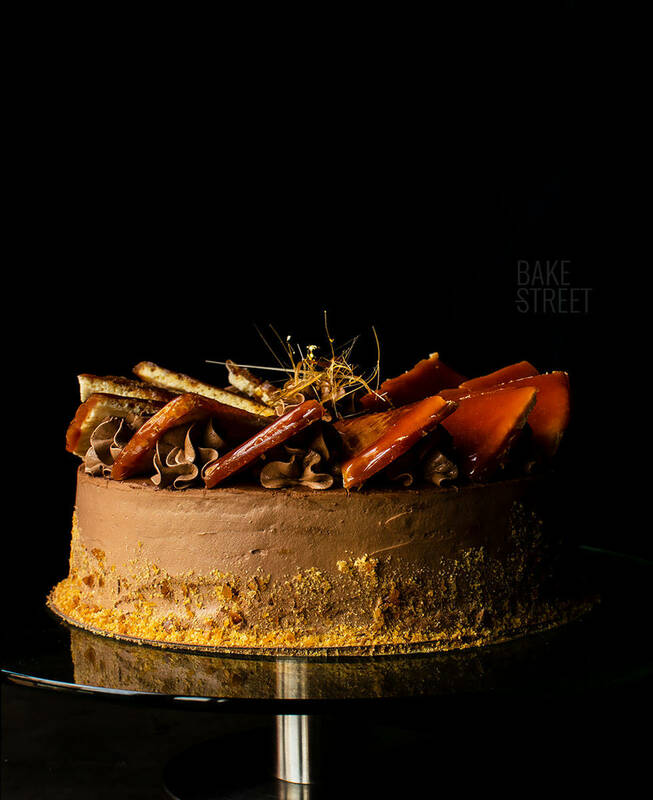 This cake consists of several layers of very thin sponge cake soaked in syrup and covered with a Moka SMBC. Uy, did I say SMBC? Hahaha, it’s after me! Or me to it? The fact is that every time I see a cake that I want to make, when I see the preparations that make it up, it’s always there. My beloved cream of butter and meringue with different aromas. I followed the recipe and the process to make this cake with the book “Baking and Pastry”. Have I already told you that I love this book? 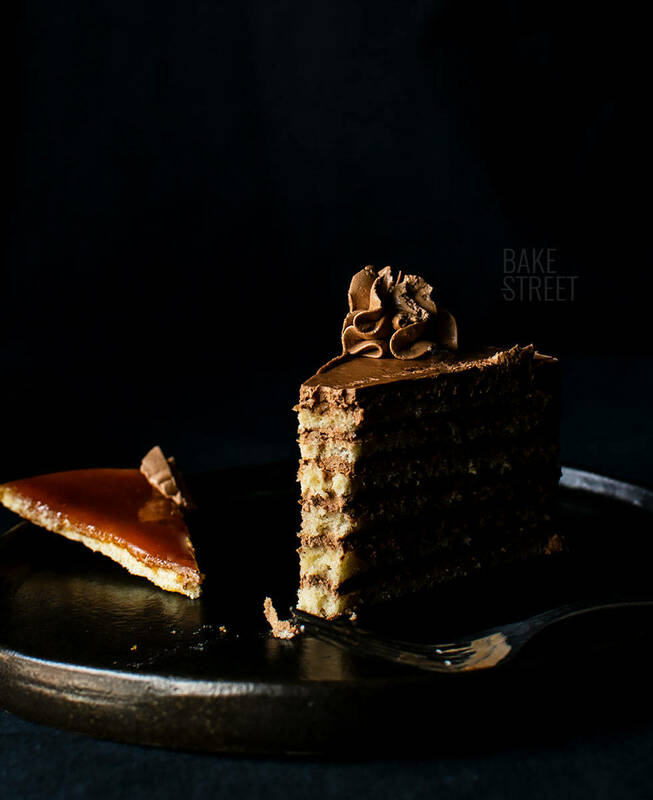 Dobos Torte, Dobostorta or sometimes referred to as “Dobosh” has Hungarian origin and was one of the fashion desserts of the nineteenth century. 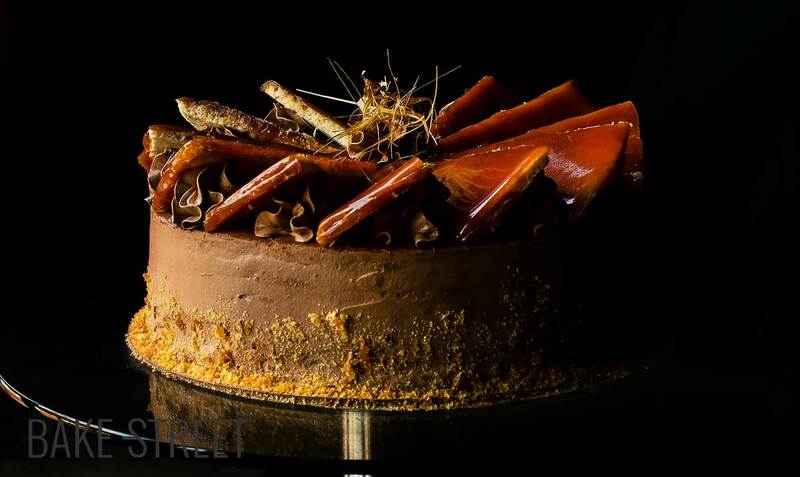 It was made by the famous Hungarian pastry chef Jozsef C. Dobos in 1884. Dobos owned a very famous shop in Budapest specializing in gourmet products. It was a time when remote shipment of products was unreliable, but his shop usually offered the public an assortment of up to 70 imported cheeses, foreign wines, breads and sometimes cakes. He used to attend international gastronomic exhibitions. For his time he was considered, what today we could define as a TV Chef or Super-star businessman. The fame of the cake to which Dobos gave his name was probably due to the extravagant filling. A cream of butter and chocolate. 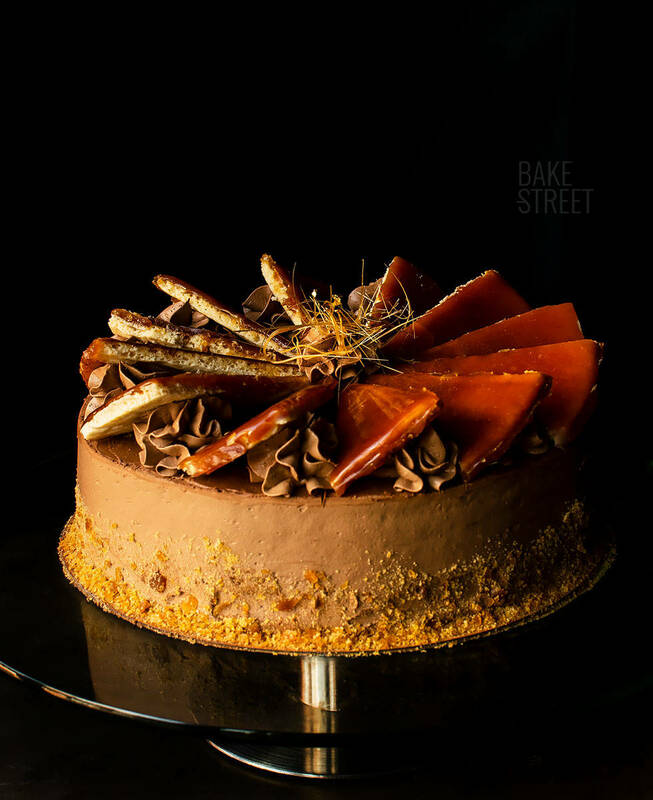 At that time the most common were cakes filled with pastry cream, whipped cream, iced cakes … Dobos brought the filling of this cream from one of his trips, this time from France. It did not take long to introduce it at a National Exhibition in Budapest in 1885, in addition to preparing it in his shop. 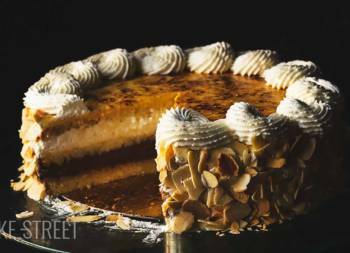 Thanks to all this diffusion, since it also became one of the favorite cakes of the Emperor and Empress Austro-Hungarian, people began to demand it very much. He refused to give up the recipe license. 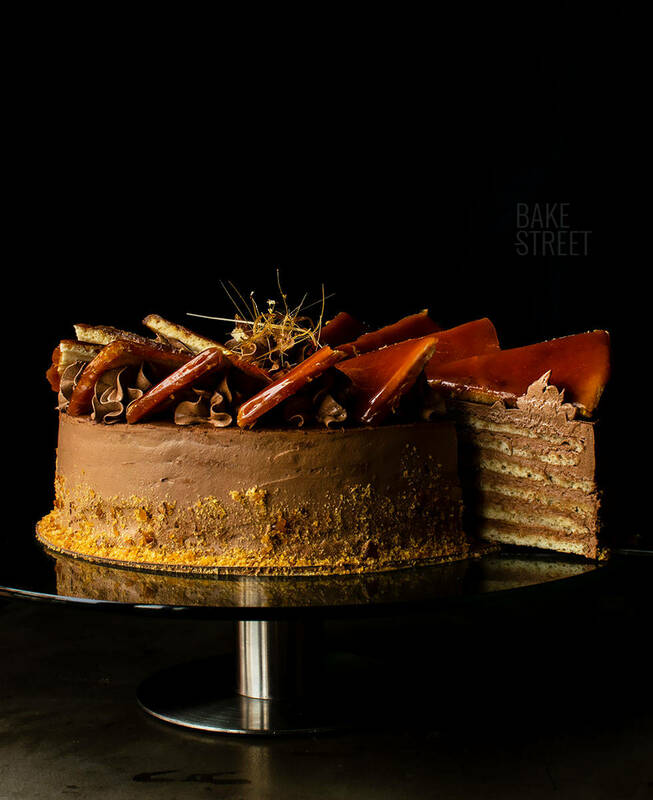 Dobos Torte began to have a presence in all European capitals. Dobos, found a way to send his cake safely so that everyone could enjoy it. Even went on tour to introduce it personally in each city until early 1900, when he retired. He gave the secret recipe to the Budapest Chamber of Bakers and Confectioners on the condition that all members could use it freely. Today many versions can be found, but according to tradition, the authentic Dobos Cake must be made with 5 layers of sponge cake that must be made individually and not cut from a single sponge cake, filled with a cream of butter and chocolate of very good quality and a final layer of sponge cake and caramel. Despite what it may seem, it is a fairly simple cake, but I will not deny that it is something laborious. We need to make 7 sponge cakes individually, that is, pipe and bake. If this step is too complicated for you, we can always spread a layer of batter on the template we have prepared and then cut it. The next steps are much more manageable. Soak with syrup, fill with cream and decorate. The result is a cake that is quite attractive to the eye and, of course, absolutely delicious. Draw circles 8 inch/20 cm in diameter on baking paper. We will be able to draw 2 for each sheet, but to bake them we will have to do it of 1 in 1 unless your trays are very wide. Remember to place the paper with the painted area facing down. Cut the tip of the piping bag and pipe the batter. Make a rectangle and then fill the inside trying to exert the same pressure all the time. We will make a circle following the pattern we have drawn. Then fill the interior trying to exert the same pressure at all times. If we have any holes left, we can use a spatula to smooth the surface. In total we need to make 7 discs. In my case I got 8, will depend on the pressure you exert when squaring the dough. Place in the oven for 5-6 minutes. We will see that it acquires a light golden color for the surface. Repeat the process with the rest of the cake discs. If we are going to use them the next day, once it is completely cold, cover it with film and leave it at room temperature. Place the syrup in a bottle with the help of a funnel, add Bourbon to taste, close and shake to mix well. 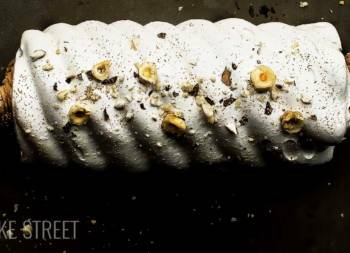 Make Moka Swiss Meringue Buttercream. Melt the black chocolate in a water-bath. Set aside. Stop, scrap the cream with the help of a spatula. Turn the kneader back on, speed 1, and add the chocolate in a fine continuous thread along with the coffee essence. Taste and rectify until the desired flavor is achieved. Whip again at high speed until the ingredients are fully integrated. To give a round finish to the sponge cakes, since piping will not have that luck, place a plate on the cake and cut the edges. Reserve one of the discs for the final decoration. Wrap it in film to prevent it from drying out. Put a small amount of SMBC and place the first disc. Soak with syrup, be generous. Put 2 tablespoons of SMBC and spread with the help of a spatula. We will try to leave it as smooth as possible. Place another disc of sponge cake and press lightly. Repeat the same process as the previous time. Soak in syrup and spread a layer of SMBC. We make this same step with all the layers. Remember to reserve a sponge disc! Spread the SMBC with a spatula over the entire surface and remove the excess with the help of an edge smoother. This layer will help us to "pick up" possible crumbs from the cake that could come to the surface when we decorate it. Refrigerate for 30 minutes for the SMBC to harden. Remove from the cold, place another layer of SBMC all over the surface, smooth out the excess and cool for 60 minutes. At this point, we can leave it refrigerated until the next day. In my case that's what I did. Cover the rest of SMBC with film and leave it at room temperature in winter, not summer. Put the cake we had reserved on a silpat or teflon sheet. Set aside. In a medium saucepan or a large saucepan, add the sugar together with the glucose or invert sugar and the lemon juice. Place at medium-low heat and let it begin to melt. Once it begins to caramelize, stir often to prevent some areas from burning. Reduce the heat a little if necessary. Once we have a golden caramel, add the butter and stir well until completely dissolved. Remove from the heat and poured on the cake. Spread with the help of a spatula to cover the entire surface and prevent the top layer is too thick. With the help of a sharp and long knife, well spread in butter, make the cuts. In total we will have to obtain 12 triangles. You will probably have to butter the knife more than once. Leave a bowl nearby with a little quantity to be able to work fast, otherwise the caramel will begin to harden and will be very difficult to cut. Take the cake out of the fridge. With the help of a spatula, cut the superior surplus of SMBC. Spread a small amount of SMBC over the top and smooth. This will give a smooth and beautiful finish to the top. Introduce the SMBC in a piping bag with a Wilton 1M tip (or the one you prefer). With the help of a knife, draw the cuts on the top of the cake. In total we will make 12 triangles. This makes it much easier to decorate the cake. Pipe a pile of SMBC in each triangle, the ideal is to pipe it in the right side of the triangle. 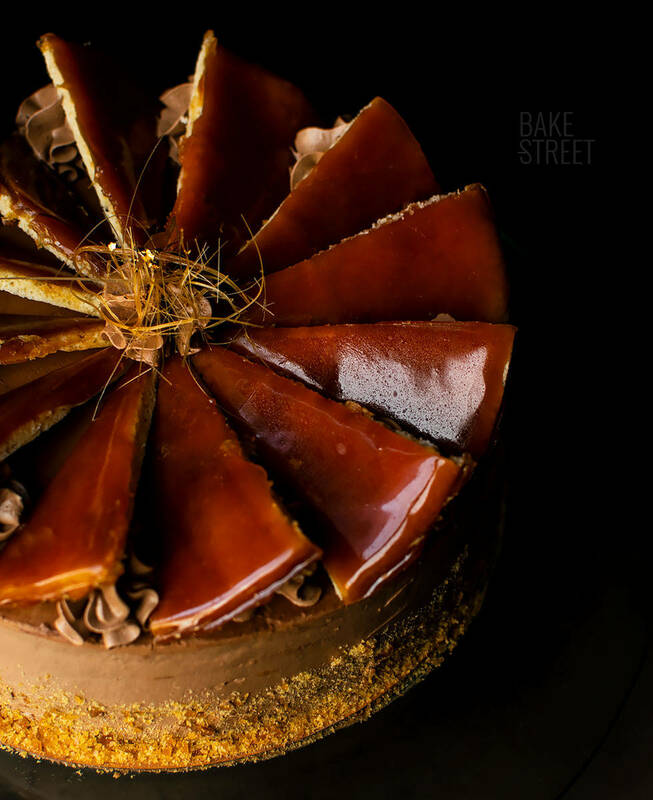 With the help of a knife, finish separating the caramel triangles and remove the surplus, cutting it, that they can have. Place in the upper part of the cake, having as pattern the marks that we have made previously. The final aspect will be very similar to a pinwheel. Pipe a small amount of SMBC in the center, decorate with caramel threads and edible gold leaf. 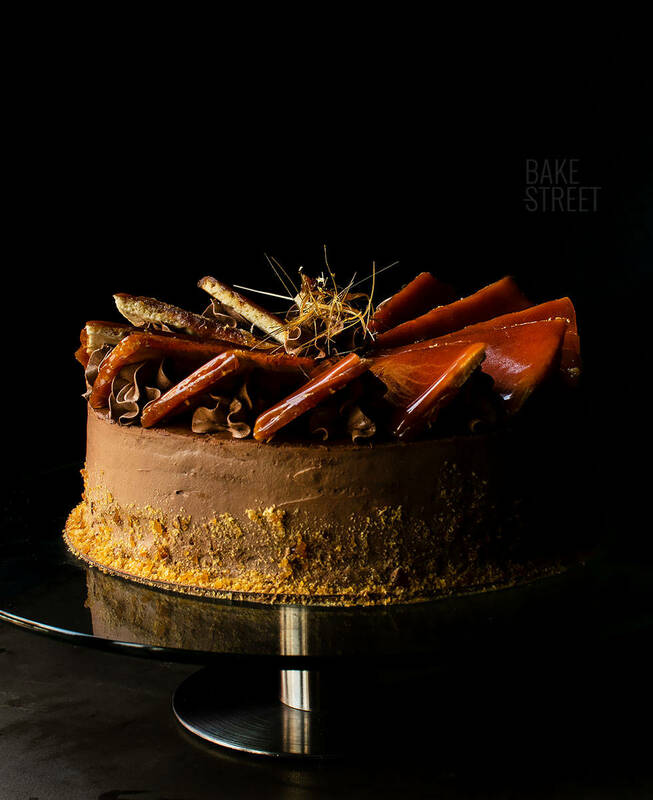 In a mortar, put caramel leftovers and crush it. Decorate the sides with this caramel powder. 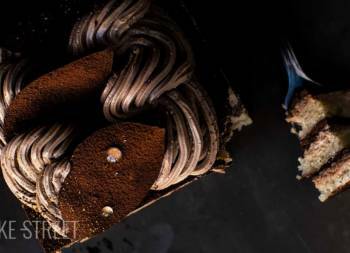 The ideal is to consume the cake at room temperature, the cream will have better texture. Otherwise, refrigerate until we need it. But remember to temper it about 5-6 hours before consuming it if it is winter. To make the sponge cakes we can either pipe them the way I teach you or pour about 90-100 g of batter (ideally weigh the whole batter before and divide by 7) in a 20 cm in diameter pan and proceed to bake. To make the syrup you can use the liquor you want. In my case I have used Bourbon, but you can use Grand Marnier or the one you prefer. Placing the cuts on the surface of the cake will make it much easier for you to place the caramel triangles. That way we can follow a pattern and make sure they are well placed. The glucose or inverted sugar that we use to make the caramel, helps us to obtain a less crunchy texture and easier to bite. The caramel threads to decorate the cake can be done with the help of a fork. You must work fast to make them. The height of the SMBC piles will be responsible for the angle of the caramel triangles when they are placed on the cake. In my case after piping them, I had to put a little more because they were too lying down and I liked them more inclined. Make a first test to see if you like the final result. The sides can be decorated or left smooth, as you prefer. In my case I wanted to use caramel powder instead of crumbled sponge crumbs or dried fruits. With the surplus that you have, mash it well in a mortar and we will obtain that powder that we will be able to use to decorate. In order to consume it with the correct texture, it must be tempered. In winter, the cream can take between 5-6 hours to acquire the perfect texture. In summer, a couple of hours will be enough. You can keep it refrigerated for 4-5 days. 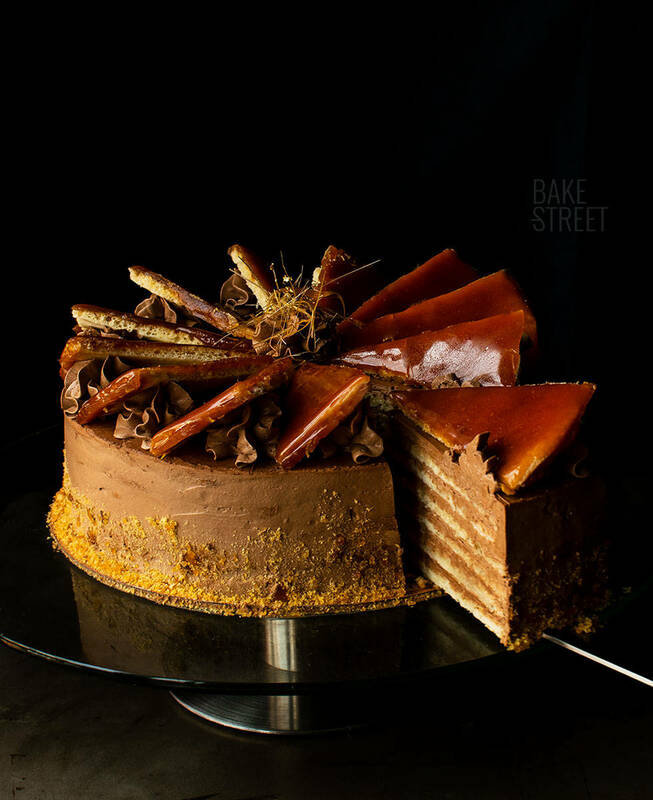 This Dobos Torte has been a wonderful discovery for me. I admit that the first thing I knew about it was its name and I fell in love with it. The book from which I have followed the recipe does not have photos of all the elaborations and this one in particular is one of them. So I decided to search it on the internet and I could see what it was like. I really liked it! It's very classic, with a very old-fashioned style, almost like vintage pastries! And it was exactly that reason that encouraged me to prepare it. Of the whole process, the part that "scared" me the most was the top layer of caramel. The fact that I had to work so fast, with no margin for error, measuring and cutting well the first time (this was the most complex for me!) made me a little stressed. But at the same time it brought me great satisfaction and the result was worth it.